I am officially blocked from the HSUS (Humane Society of the United States), the Food Babe and Moms Across America. Don’t be fooled about Moms Across America. It is an anti-GMO website. On each of these blocked sites, I have been respectful in my comments and/or questions. I have not bombarded their facebook page with posts or links, but I do occasionally disagree with the misinformation they post and I will refute their statements. And the result? Because I have been blocked, I am no longer allowed to inquire any misinformation on their site or discuss the issues with them. So, how do we have a conversation? That is the point, they do not want a conversation. HSUS pushes a vegan agenda and wants to eliminate or greatly reduce animal agriculture. The Food Babe pushes her agenda of food fear and Mom’s Across America is an anti-GMO site. Even if I don’t agree with their position, what is wrong with having a healthy discussion, with opposing views? Let’s examine biotechnology, or more specifically GMOs. How can I say biotech crops are safe? I am not a scientist nor do I have a science background except for the BIO-100 class I took in college. Just because I don’t have a science degree doesn’t mean I can’t use my critical thinking skills and make a determination if a study is credible or not. When was the study conducted? Who stands to benefit from the results? Is there a conflict of interest? Is there more than one study with the same results? And if there is something I don’t understand, I look for resources or people that can answer my questions. And I also read and learn. And then after that, I read and learn some more. Yes, no doubt there has been research done and funded by Biotech companies. In fact, there are over 2000 studies that affirm GMOs are safe. But there also have been many research studies done from unbiased sources–in fact over 165 such studies. And guess what? The results are all the same, biotech crops are safe. But the anti-GMO groups do not want to hear this. They don’t want others to hear this and they don’t want to talk about it. Instead, they continually refer to flawed research and use that as a basis for their claims that GMOs are causing sickness and death resulting from using biotechnology. The latest example of this is a study where the anti-GMO people have publicized a study which shows pigs who ate GMO corn had a higher level of stomach inflammation than pigs that were fed non-GMO corn. But the study was flawed. In this article, Lack of care when choosing grains invalidates pig feed study, the study showed a lack of care. But this study was posted numerous places – even health websites such as Prevention.com. And in another example, that anti-GMO people like to quote, was a study performed by the French scientist, Seralini. It showed rats had a higher level of tumor growth when fed GMO feed. Again, the study was flawed. Even a junior high science class could tell you where the study was flawed. But people believe this. You can argue that people don’t understand science, don’t want to know about science and don’t trust science. In the end, the results could be catastrophic if we don’t acknowledge and accept science. After observing these examples, I began to wonder why people believe studies that are flawed and deny study after study after study that proves biotech safety? According to an article on Forbes website, “A Tour of the Brain of an Anti-Crop Biotech Activist” there are factors that contribute to this phenomenon. Generally, people are attracted to conspiracies. The conspiracy here is that Monsanto is out to have total control over the entire world’s food supply. They are the “evil, mad scientist” people that we see in some of the old Frankenstein-type movies. Certain anti-biotech leaders are trapped in their own mind. Think of the John Malcovich movie. Being “trapped in your mind” results in people not being able to use critical thinking skills. And this is from people who should know better. People like to follow groups. It is easy for others to say, “well if they think and believe so, then I probably should too.” They don’t have to use their own critical thinking skills because “someone else is doing it for them”. And others like to look at European countries and say things like, “Europe has banned all GMO crops, so if they banned them, we should too.” Well, the truth is, Europe does not have a total ban on GMO crops. In fact, their livestock is fed GMO corn. And now the Britians are having second thoughts about their position on biotech crops. Read the article – David Cameron, “It’s time to look again at GM food”. And it’s not just biotech crops studies that people are not using critical thinking skills. Agricultural animal well-being is also affected. For example, groups like HSUS that have pushed their way into food retail companies’ CEO offices and presented only a one-sided view on how livestock should be raised. And these mega food corporation’s CEOs actually fall for their rhetoric. It doesn’t take a lot of research to learn of HSUS’s vegan agenda and deceptive way of raising funds for their organization. Again, what happened to critical thinking? Did they not think to contact animal agricultural groups and get their point-of-view on these animal welfare issues? You know, the people that take care of animals day in and day out. It’s beyond my comprehension why these companies did not or would not talk to their supply chain. Really? You don’t want to know how your decisions will impact your supply chain (farmers), which, in turn, will affect your business? So now what? We need to be using our God-given brains. Let’s not get caught up in conspiracy theories or follow the leader mentalities. 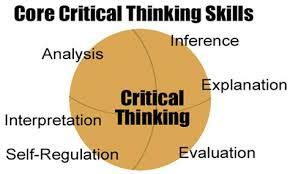 Let’s use our brains by using our critical thinking skills. Let’s listen to each other, ask questions and most important – talk to each other. Where did you see this list of studies? I am familiar with a list of that size that is being promoted so that people actually think (like you) that that is a list of studies showing that GM crops are safe. If it is the list I know, it is a random collection on the general topic – many show findings either of harm, or findings that are opposite to those claimed by industry and regulators related to substantial equivalence. Regarding Monsanto looking for control of the food supply – the wikileaks cables provided evidence for the concern that would previously have been labelled as a conspiracy. Thank you Madeleine for your response. I will definitely take a look at your resources you have provided. This is the type of conversation we need to have. Both Carman and Vlieger are known anti-GMO campaigners, and the study itself does not stand up to scientific scrutiny. They’re creating “evidence” to support their views, and not altering their views based on demonstrated evidence, which is what a true scientist should do. I’d agree completely that we need to have conversations. The path that we are taking in US agriculture has only one eventual end. And that is an imported food supply. The big players want that. And both sides, one worse than the other, seem to be happy to be pawns in that end. And by the way, glyphosate is showing up in everything. And unlike the common message in farm community, roundup doesn’t just disappear when it hits organic matter. I like to have civil discussions on these topics but I too am banned from a lot of sites.